When the Premier League kicked off for a new season last month it wasn’t just new teams and players making their mark on the game. 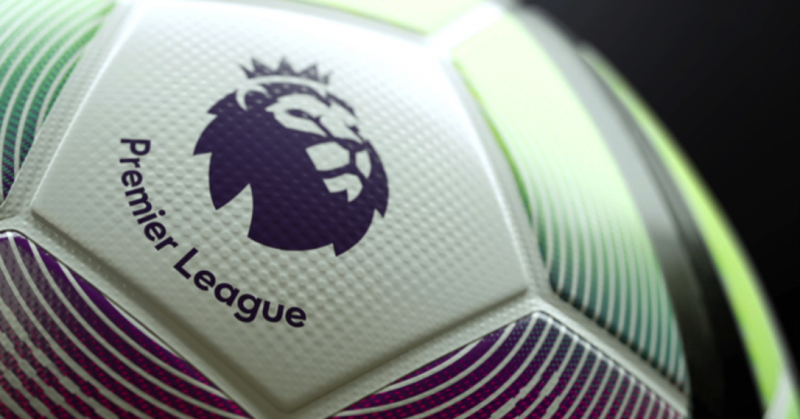 Barclays started the new season as the Official Bank of the Premier League, following the league’s announcement it would end title sponsorship. The first weekend of the 2017/18 season also marked the start of a three-year partnership deal with Cadbury’s, as they become the Official Snack of the league, and it is the first season where brands can sponsor the shirt-sleeve of team kits. It is also the first Premier League season without a beer brand sponsoring a shirt, and the first time there will be so few UK-based brands on players’ shirts. To learn more about how brand fans interact with Premier League teams, we used our Constellation tool to look at the behaviours and interests of Alcohol, Airline and Sportswear UK brand audiences. Here we can see that Arsenal received the most interest from the Alcohol brand audience compared to other Premier League teams. It is also worth noting that Arsenal FC’s two primary sponsors are Emirates and Puma – leading Airline and Sportswear brands. Despite not currently having a brand partnership with an Alcohol brand in the UK, the north London team do have regional partnerships with Dashen Brewery in Ethopia, and Star Lager Beer in Nigeria. The team see significant attention from the Alcohol brand audience, followed by the Airline and Sportswear brand audience groups. Liverpool currently have multi-year partnership deals with Carlsberg and Malaysia Airlines, with smaller partnership deal with Sportswear brand New Balance. West Ham also saw more interest from the Alcohol brand audience, followed by the Sportswear and Airline brand audiences. The share of attention from the audience groups somehwhat aligns with their current partners - their principle partner is Umbro, and one of their official partners include Heineken. They currently don’t have an Airline brand partnership. Of the top six performing teams in the 2016/17 Premier League, five of those (Chelsea, Tottenham Hotspur, Liverpool, Arsenal and Manchester United) also appeared in the top six teams ranked by volume of interest from the Alcohol audience. A look at the data shows that only four Premier League teams (Tottenham Hotspur, Manchester City, Leicester City, and Newcastle) received a larger share of attention from the Airline brand audience compared to the Alcohol and Sportswear brand audiences. Of these four teams, just Manchester City and Leicester City have an Airline partnership. However, it is worth remembering, Newcastle have just been promoted from the Championship, where Airline partnerships are very rare. 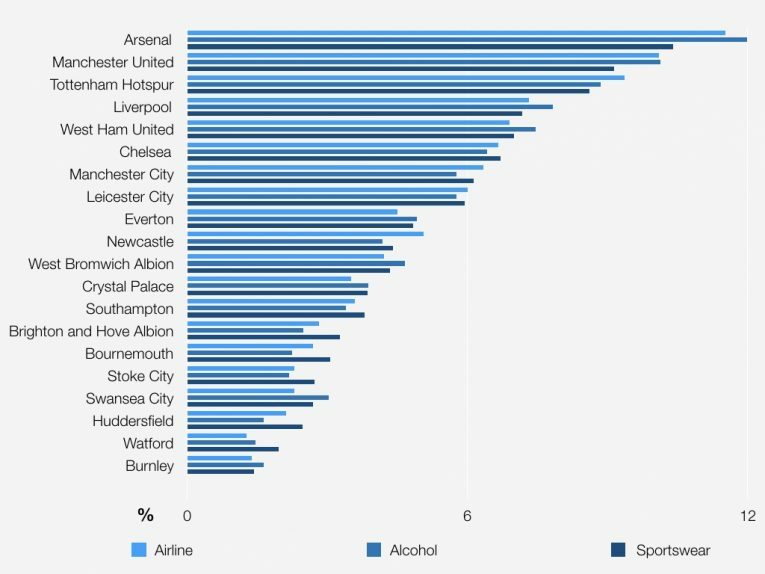 Tottenham received the largest share of interest from the Airline brand audience compared to the interest from the Alcohol and Sportswear brand audiences. When this audience group talked about Tottenham they focused on the team’s performance in the Premier League, FA Cup and UEFA Champions League. Manchester City also saw a higher share of interest from the Airline brand audience which mirrors the structure of their current partnerships. City’s global partners include Eithad Airways and Nike, and regional partners include Heineken. Again, looking at the correlation between the top six performing teams in the 2016/17 Premier League, the same five teams (Chelsea, Tottenham Hotspur, Liverpool, Arsenal and Manchester United) also appeared in the top six teams ranked by volume of interest from the Airline brand audience. When looking at the data surrounding the Sportswear brand audience and their interest in Premier League teams, we start to see something very different from the previous brand categories. The correlation between the Premier League teams who received a highest share of interest from the Sportswear brand audience, shows the opposite to what we identified with the Alcohol and Airline brand audiences - Of the bottom five teams who avoided relegation in the 2016/17 Premier League, the majority of the these (inc Watford, Burnley FC, Swansea City and Stoke City) saw a higher share of interest from the Sportswear brand audience. Furthermore, two of the three teams promoted to the Premier League for the 2017/18 season (Huddersfield Town and Brighton and Hove Albion) also received more attention from the Sportswear brand audience. All of this confirms an interesting brand audience behaviour - namely that Premier League teams who perform best see more interest from Alcohol and Airline brand audiences, whilst the teams who perform the least well, see more interest from Sportswear brand audiences. Whilst we're not going to jump to any conclusions as to why without further research and additional data, it certainly highlights a trend which brands in these categories should be aware of.